Israel on Thursday signed an agreement with Greece and Cyprus that promises to link the three countries’ electricity grids via an underwater cable. 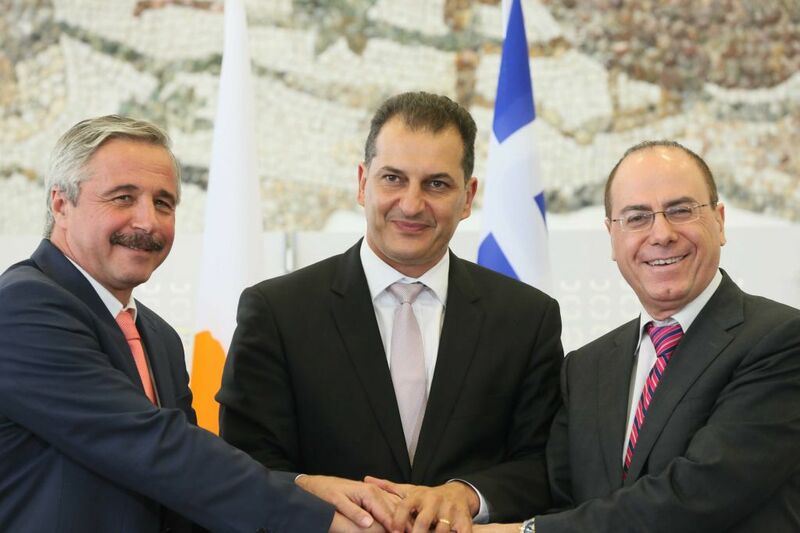 The tripartite energy memorandum of understanding came after nearly a year of negotiations and was signed in Nicosia, Cyprus, by Energy and Water Resources Minister Silvan Shalom; Nicos Kouyialis, the Cypriot minister of agriculture, natural resources and environment; and George Lakkotrypis, the Greek minister for the environment, energy and climate change. The underwater, 2,000-mega-watt EuroAsia Interconnector “will lift Cyprus out of energy isolation, with cheaper electricity which will help our economy become more competitive,” Lakotrypis said. The agreement also dealt with natural gas and water issues. The three countries will work together to protect natural gas fields, and have launched a project to cooperate with treatment of sewage as well as recycling water for use in farming. Turkey has challenged Cyprus’s right to some of the gas fields it claims, and has even threatened military intervention. Kouyialis said that the agreement signed on Thursday marks the continuation of an already existing partnership. He noted that Israeli companies were involved in the establishment of three of his country’s four permanent desalination plants. “A new era of cooperation starts today in the field of sewage treatment and waste water reuse that will help Cyprus improve its water balance, as substantial and constant quantities of recycled water will be utilized in the best possible way,” said Kouyialis. Israel’s partnership with Cyprus on natural gas is seen as a challenge to Turkey, which has in threatened Cyprus over gas fields it claims for itself. Jerusalem upgraded its relationship with Cyprus and Greece as its ties with Turkey, once the Jewish state’s prime regional ally, began to deteriorate following the rise of Islamist President Recep Tayyip Erdogan in 2007. The proposal will be brought before the cabinet on Sunday for government approval.